The cotton yarn and other yarns market is estimated to be valued at USD 10.27 billion in 2015. It is projected to grow at a CAGR of 4.2% from 2015 to 2020. The base year considered for the study is 2014 and the forecast period is from 2015 to 2020. The cotton yarn and other yarns market is segmented on the basis of types into natural and artificial yarn which are further divided into their subsegments. It is also segmented on the basis of regions into North America, Europe, Asia-Pacific, and the Rest of the World (RoW). With the higher levels of commercialization of the fabric market in the North American, European, and Asian economies and increasing consumer consciousness with regard to quality, the demand for varied products is expected to enhance the market growth in the near future. This report includes estimations of market sizes for value (USD million) and volume (KT). Both top-down and bottom-up approaches have been used to estimate and validate the size of the global cotton yarn and other yarns market and to estimate the size of various other dependent submarkets in the overall market. 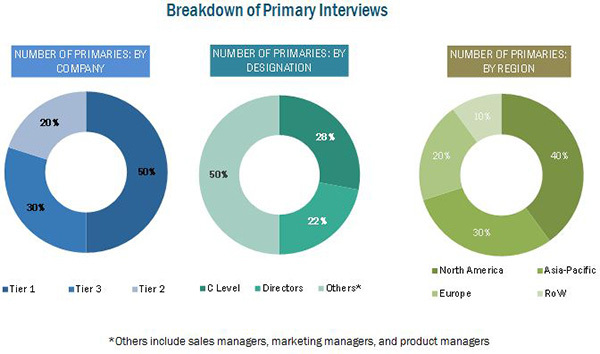 Key players in the market have been identified through secondary research, and their market share in respective regions has been determined through primary and secondary research. All percentage shares, splits, and breakdowns have been determined using secondary sources and were verified through primary sources. The figure below shows the breakdown of profiles of industry experts who participated in the primary discussions. Based on the type, the global market is led by the artificial yarn segment, followed by the natural yarn segment in terms of volume. Based on the application, in terms of value, the textile yarn market was led by the apparel segment followed by home textile. Textile yarn is manufactured on a large scale in regions where there is availability of cheap labor. Among the varied types for artificial yarn products, such as polyester, nylon, viscose, and acrylic, polyester accounted for the largest market share, followed by acrylic and nylon. Polyester and nylon are largely used in European and Asian countries in the apparel industry and is used in blended varieties as well. Asia-Pacific accounted for the largest market share for textile yarn, followed by North America and the RoW region. Textile yarn products such as cotton and polyester are among the widely used products in Asia-Pacific; changing consumption pattern is one of the major factors driving the textile yarn market in this region. The North American region is projected to be the fastest-growing market with investments from several multinational manufacturers, especially in countries such as U.S. and Canada. Stringent government regulations for the trade of textile yarn products pose as one of the restraints for the textile yarn market. Also the volatility in production level of plant and animal source yarn hinders with the growth of this market. 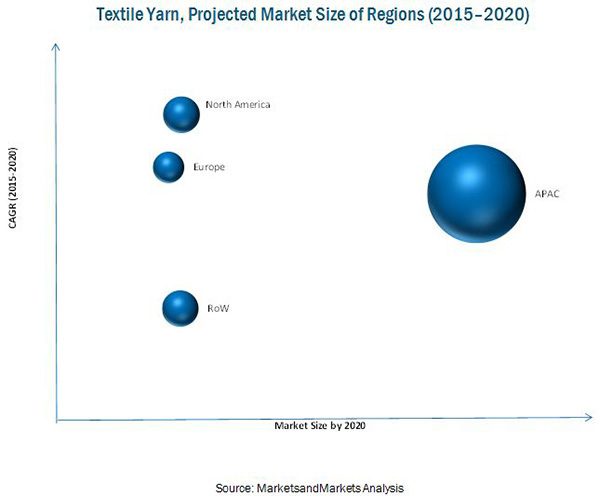 The textile yarn market is fragmented and competitive, with a large number of players operating at regional and local levels. The key players in the market adopted acquisitions, new product launches, expansion & investments, and joint ventures as their preferred strategies. Prominent players such as Parkdale Mills Incorporated (U.S.), Vardhman Textiles Ltd. (India), Weiqiao Textile Company Ltd (China), Huvis Corporation (South Korea), and Grasim Industries Ltd (India) have been profiled in the report. 12.10 Birleþik Koyunlulular Mensucat TIC. VE SAN. A.Þ. Figure 18 North American Market is Expected to Experience Exponential Growth.